The Denver Broncos’ punter was born in Bangor. Here’s how he got to the NFL. 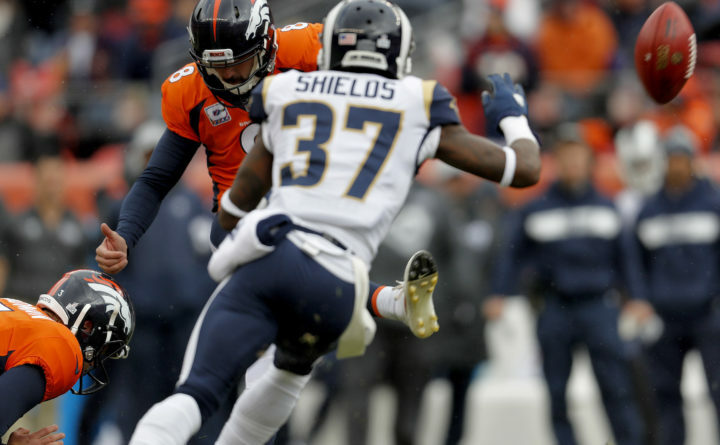 Denver Broncos kicker Brandon McManus (8) kicks a field goal as punter Colby Wadman holds during the first half of an NFL football game as Los Angeles Rams cornerback Sam Shields (37) pursues, Sunday, Oct. 14, 2018, in Denver. It is a day Harry and Sharon Rideout will never forget. On Oct. 7, the Hermon residents were among the fans at MetLife Stadium in East Rutherford, New Jersey, watching their grandson, Colby Wadman, make his National Football League debut as the punter for the Denver Broncos against the New York Jets. It was the first time the Bangor-born Wadman had punted in a game since Nov. 19, 2016, when he played for the University of California Davis. He continued working out and kicking, and he was eventually added to the Broncos’ practice squad Sept. 26. When starting punter Marquette King suffered a thigh injury and couldn’t play, Wadman was activated. Wadman also serves as the holder for place-kicker Brandon McManus, a duty he had performed in high school and college. Wadman was born at Eastern Maine Medical Center in Bangor on April 19, 1995. His mother, Shari, had attended Bangor Christian School after the family moved to the Bangor area in the 1980s. His father, Scott, is from Winchester, Massachusetts. Shari was the middle of three daughters raised by the Rideouts. After spending a year in Glenburn, the Wadmans moved to Chesapeake, Virginia. After the Wadmans divorced, Colby lived in Thousand Oaks, California, where he played basketball and baseball in addition to football. He was the starting punter at UC Davis for four years and averaged 41 yards on career 244 punts. As a senior in 2016, he averaged a career-best 43.2 yards per punt. Wadman has punted in three games for the Broncos and has averaged 42.2 yards with a net of 35.7 yards. Seven of his 18 punts have been inside the opponents’ 20-yard line. The 23-year-old Wadman has improved his averages with each game, netting 40.7 yards and 43.5 yards per punt in last Thursday’s 45-10 victory over Arizona. Sharon Rideout said fans at the Jets game commented on the impressive hang times on Colby’s punts. The Rideouts said their grandson has always been a hard worker. When he came to visit them a couple of years ago, he went up to the University of Maine and worked on his punting. “He has always found a place to work out. He is a diligent young man. He has been persistent [in trying to attain his goals],” Sharon Rideout said. “He used to go out early in the morning and work on his kicking when he was at UC Davis,” said Harry Rideout, who added that Colby was a good basketball player in high school. But football was always his first love. They also said he has never forgotten his roots and returns to Maine to visit them and his other relatives across the state. Prior to the Jets game, in a story by Denver Broncos digital media contributor Zach Pereles, Wadman gave himself a three-year window after graduation to earn an NFL job. He moved back home to Thousand Oaks last December and punted every day, often by himself, in the hope he might get a chance. “I was just kicking, going out by myself, kicking every single day,” Wadman told Pereles. “I’d find some guys maybe I knew around town and just kick with them. I’m just doing whatever I can to be ready, stay confident with my punts so when and if my number is ever called, I’ll be ready for it. Specials teams coordinator Tom McMahon had confidence in him. The 3-4 Broncos visit Kansas City (6-1) next Sunday at 1 p.m.